The Renewable Energy and Energy Efficiency Project (REEEP), funded by USAID and Power Africa, seeks to improve access to renewable energy (RE) technologies, improve access to finance for RE technologies and use RE technologies to improve various sectors such as health and agriculture. One of the most important achievements of the project is its collaboration with GIZ’s Nigeria Energy Support Program (NESP) to develop curriculum for seven training courses for RE/EE subjects in Nigeria. 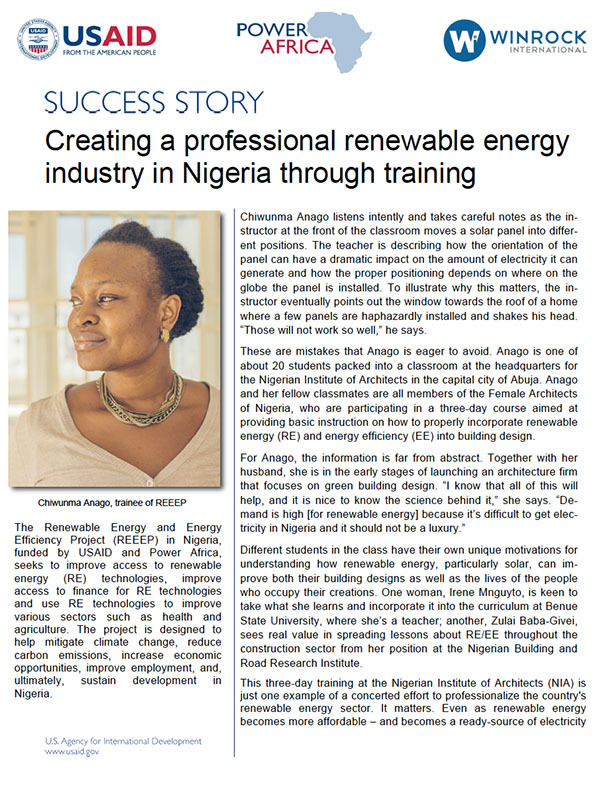 These are the first in-depth, certified training courses for Nigeria’s renewable energy and energy efficiency (RE/EE) sector. From solar PV installations to mini-grid design and rural hydropower civil engineer, the curricula for trainers and students can be found at the Energypedia page here.